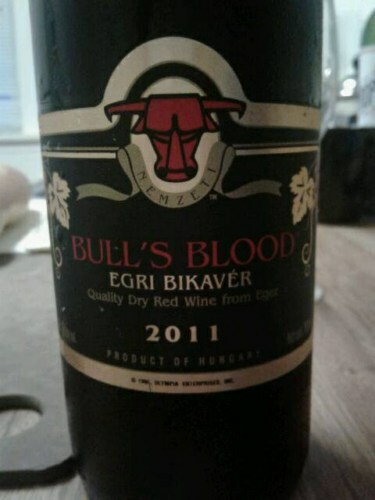 Bull's Blood is an ancient wine from the 16th Century. When the Turks attacked Hungary, the inhabitants showed no fear, and the Turks eventually gave up. Rumors spread the reasons for the hungarian strength was that they mixed the blood of bulls into their red wine and the name stuck. Traditionally the main grape was Kadarka, being replaced by Kekfrankos and Portugieser, also ingredients in Bull's Blood (along with 7 other possible varieties). The color is a medium ruby with violet towards the rim. It smells like black pepper, fallen leaves, dark fruits, and like ripe plum. 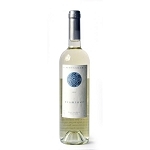 The acid is high and the wine is not flabby, but it has a mouth-coating property that I can't quite explain. 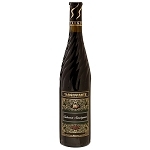 There are some pleasant pepper, plum notes and almost tastes like the old oak barrel the wine was probably matured in.